Now in its fifth year, the Scotch Beef Farm of the Year award, which is organised by AgriScot and Quality Meat Scotland (QMS), sets out to find, and reward, a Scottish farm which exemplifies the best in beef cattle production. This year’s competition was launched today (July 21st 2016) at a charity Open Day hosted by the Watson family of Darnford, near Banchory – winner of Scotch Beef Farm of the year 2015. “Running Darnford is very much a team effort, involving family, neighbours and many others and winning the award was very much a reflection of that teamwork,” said Peter Watson speaking at the event attended by around 400 people. 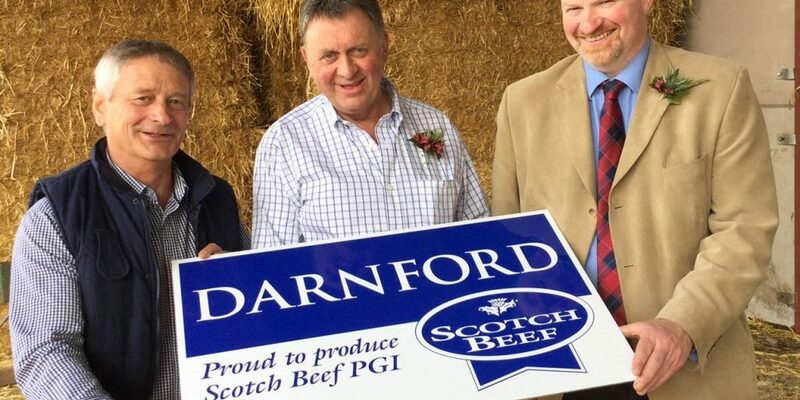 “We were delighted to be nominated and having been through the process I would definitely encourage others to apply and play a part in promoting Scotch Beef,” added Mr Watson, who farms Darnford with sons Adam and David and their wives Aynsley and Lynne. Doug Bell, Head of Industry Development with QMS, said the organisation was proud to support the award. “The award helps to raise the profile of the commitment and passion of the cattle farmers in Scotland who work hard to produce top-quality Scotch Beef PGI. Those who work as suppliers of services or products to the industry, from vets to feed manufacturers, are encouraged to nominate customers who are doing a great job as well as the many others involved in the production chain such as processors, hauliers and auction markets.